Extra Blue Pine will grow to a maximum height of 45' and a width of 35'. Its steel blue needles make it a striking addition to the landscape. It will tolerate drought once it is established. 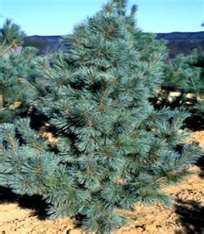 Extra Blue Pine likes to be planted in full sun to partial sun. The best use of this pine is as an accent due to its blue coloring. The steel blue needles will hold their color through winter. Extra Blue Pine also attracts bees and is deer resistant.